Add raspberries to a bowl and blend until smooth. Stir in honey. 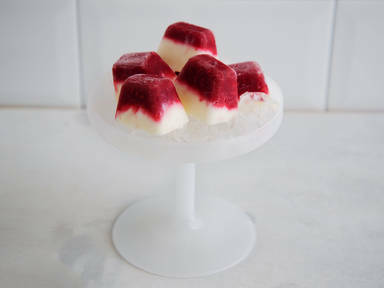 Fill each ice cube tray with raspberry mixture to one third. Add Greek yogurt, lemon juice and remaining honey to a mixing bowl and stir to combine. Add evenly to ice cube tray until they are filled completely. Freeze for approx. 4 hrs. Enjoy icecold!